Remember the function served by plants and structures is more important than their appearance. In other words, don't base your planting decisions solely on what a plant looks like. 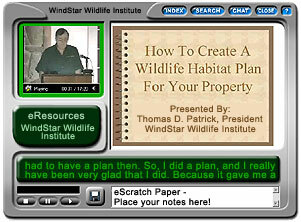 Following are WindStar Wildlife Institute's plant recommendations for wildlife habitats in Ohio. Ohio's topography consists of rolling plains for the most part. In the north, Ohio borders Lake Erie. The Lake Erie Plains, part of the Great Lakes Plains, extend southward from the lake into Ohio. The Allegheny Plateau is located in the east. The Central or Till Plains cover the western portion of the state. The Appalachian or Allegheny Plateau covers the eastern half of Ohio, south of the Lake Erie Plains. The northern part of the Appalachian Plateau consists of rolling hills and valleys. The southern two thirds of the Appalachian Plateau consists of steep hills and valleys and is the most rugged area in the state. The Bluegrass Region consists of hilly and gently rolling land. The Ohio shoreline lines 312 miles of Lake Erie.The Ohio Native Plant Society can provide lists of plants for a specific region.